Is Public Shaming the Right Way to Discipline Kids? 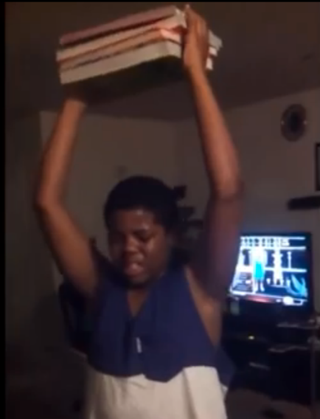 It’s a son forced to hold a stack of books over his head until he’s in pain as punishment for stealing. It’s a girl wearing a “shame shirt” to school for bringing home bad grades. It’s an old-man, Sherman Hemsley-esque haircut for a misbehaving boy. It’s an underperforming student strolling a busy city intersection with a sign detailing his academic crimes. The “it” is public shaming. Agree with it or not, it’s an increasingly popular—and most certainly creative—way to check unruly and disrespectful kids. Social media is the new hip-hop—not in musicality, of course, but in the blame it shoulders for behavioral and cultural pandemics. Public shaming has caught fire across Facebook and Instagram as parents document pictures and videos of their innovative discipline. Much of that seems to be shared in search of verbal high-fives and affirmative yeah-that’s-rights from fellow parents and followers. The irony is that parents are publicly punishing children’s unseemly behavior on social media with unseemly behavior of their own. In many cases, public shame is deployed as an alternative to spanking, which carries with it potential repercussions from local child-protective agencies and doesn’t have the far-reaching reverberations that a shared photo of a kid behaving badly could and often does. No teenagers want to become Vine or Twitter famous because their mom’s video of them wearing a sandwich board with graphic detail about how poorly they’re doing in school has gone viral. Still, psychologists and parenting experts frown on public shaming, some even likening it to adult bullying. “Discipline is supposed to correct behavior and set boundaries so that the children can then learn how to regulate themselves and make good decisions when their parents aren’t around. You teach them what they’re supposed to do so they can make the right decisions on their own,” said Satira Streeter, executive director of Ascensions Psychological and Community Services, Inc., in Southeast Washington, D.C. The judicial system has always used public humiliation in varying degrees but is incorporating it into more sentences because, as a punishment, it costs nothing, it eliminates the need to put young people in contact with hardened criminals in prisons and detention centers, and it teaches a valuable lesson of personal accountability. Billingsley said she met her daughter where she was—online. In this case, public shaming worked. “She saw the consequences. She said, ‘I wish I had never done that,’” Billingsley told CNN. And when the picture reached 10,000 shares in a matter of hours, the young lady saw firsthand how quickly any and everything can move around the Internet. That’s a lesson she wouldn’t have necessarily gotten had her mother not taught it on the Web. Ultimately, talking with children about their choices after they’ve messed up just as much as before is the baseline for all corrective behavior. It’s not social media shareable, and it’s not laughable like an old-man haircut, but it works.